A few years back I came across Ghostbusters VHS at a local yard sale, I loved the movies and cartoon growing up and I couldn't wait to have my kids enjoy it with me. 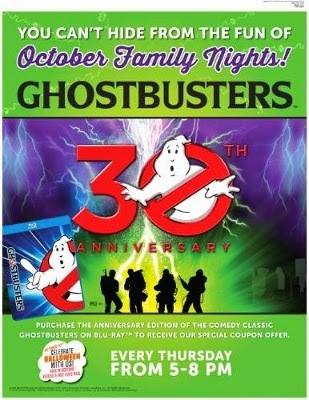 Now years later my kids are huge Ghostbusters fans and come to find out Ryan's, HomeTown Buffet and Old Country Buffet are celebrating both the anniversaries of Thursday Family Night and the 30th anniversary of Ghostbusters! To sweeten the deal the Ghostbusters I and II are being released to Blu-ray as special anniversary editions that will feature a $3 off dinner coupon good at any of the 324 family style restaurants. In honor of the Ghostbusters release and the month of October, all 324 family style restaurants will be hosting Ghostbusters themed activities every Family Night in October. Enter to win a Ghostbusters DVD. Contest open to U.S. residents only, contest will end on October 30th, 2014.